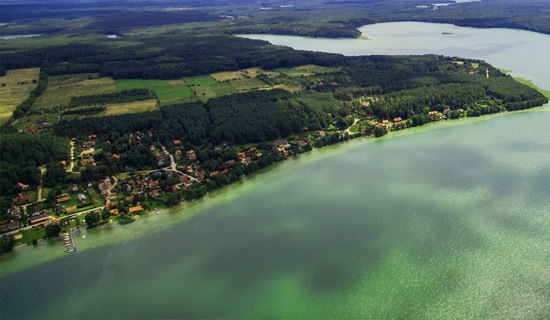 The cottages are situated on Pluszne Lake: 950 hectares of clean water with sandy bottom, 20 meters from the shore depth up to 100 cm, long and gentle lakebed slope. Ideal for swimming. 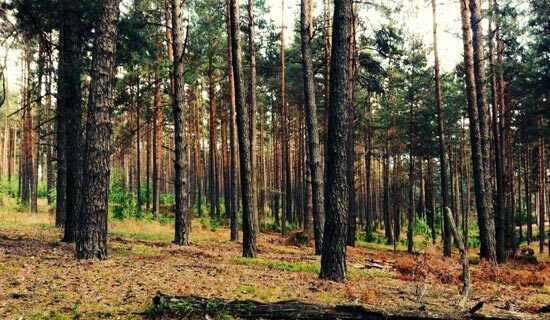 A beautiful forest covering an area of 150 km2. An ideal place for hiking or biking. Perfect also for a morning run. It is heaven for all nature lovers. Edible berries and mushrooms are abundant in the season. Pluski is an old fishing village, 25 km from Olsztyn. There are a pub / restaurant, a fish and chips shop and two stores in Pluski. Aquapark is located in close proximity to the village. Our lakeside holiday cottages are perfect for families and groups of friends. 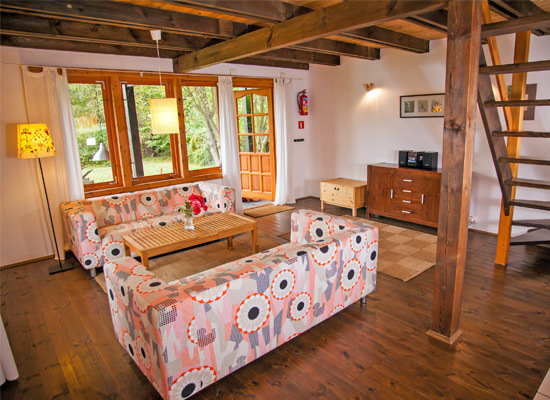 All of our cottages are fully-furnished and sleep up to six people. 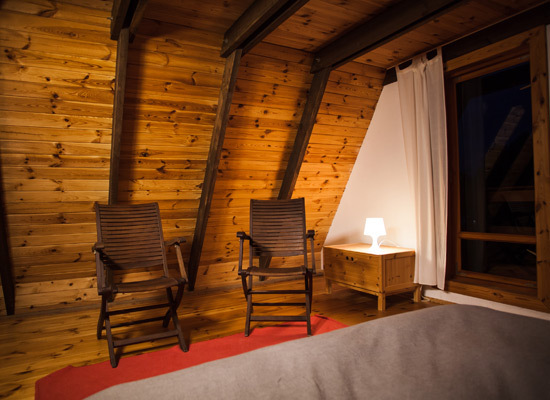 Three separate bedrooms, an open-plan living room with a kitchen, a roofed terrace and a balcony with a stunning view of the lake are all at your disposal and awaiting your arrival. 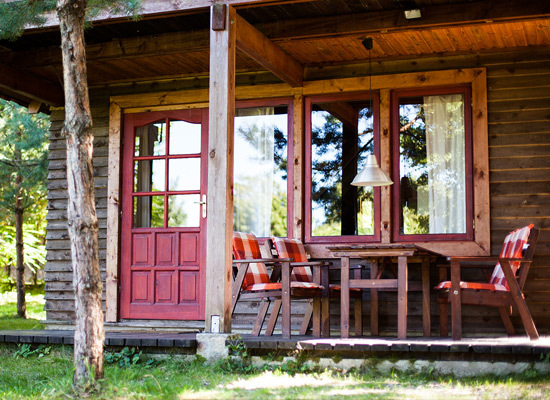 All of our cottages are situated directly on the lake. Our lake deck is a perfect place to relax and enjoy the sunsets. You are free to use the deckchairs or our boats and kayaks if you would like to go exploring the lake. 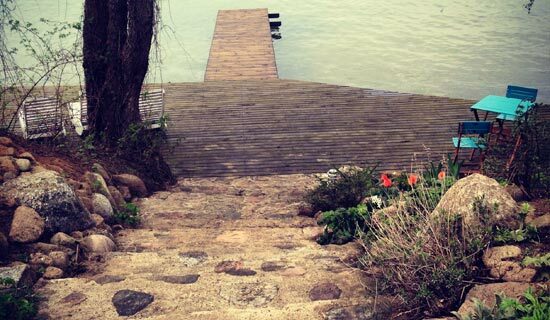 The depth of the lake does not exceed one meter within 20 meters of the shore. As a result, the water is exceptionally warm and the lakebed clear and sandy. It is ideal for swimming or for kids to frolic in water. In this stunning region you will be able to enjoy its amazing nature and varied cultural heritage. The region, nicknamed 'The Land of a Thousand Lakes' charms visitors with its natural beauty. Magnificent gothic castles, picturesque towns and villages are scattered throughout the region. Warmia and Masuria are actively involved in the cittaslow movement whose one of the most important principles is sustainable life. There are over 130 places preserving the culinary heritage where you can enjoy the local food. 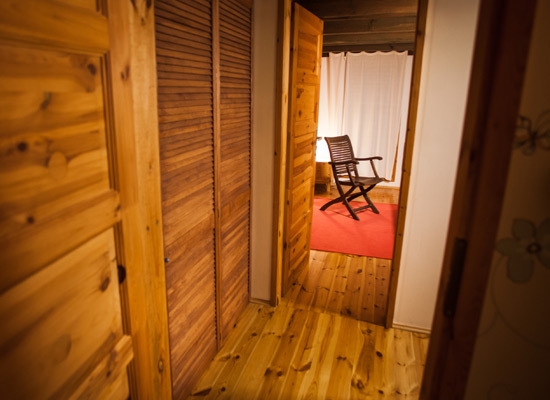 What will you find inside our cottages? 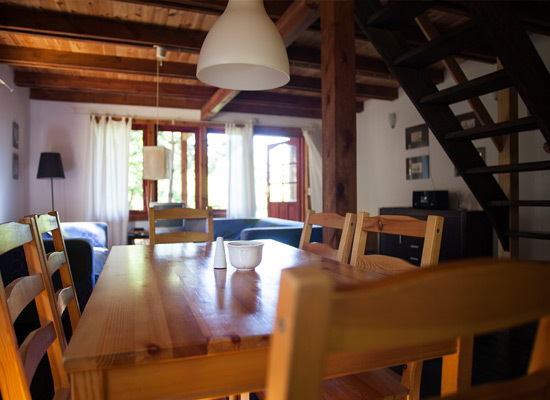 To enter the cottage you walk through a roofed terrace with outdoor dining furniture. In the open plan living room there are two sofas, a coffee table, a TV set and a chest of drawers. 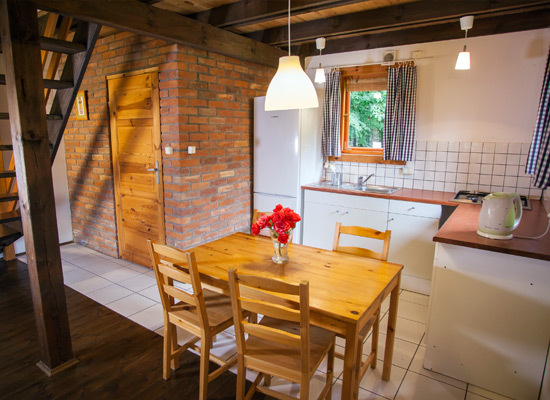 In the adjoining kitchen area there are a large fridge with a freezer, gas cooker and all essential utensils and kitchenware to prepare and serve meals: pans, frying pans, cutlery, plates, cups and glasses. 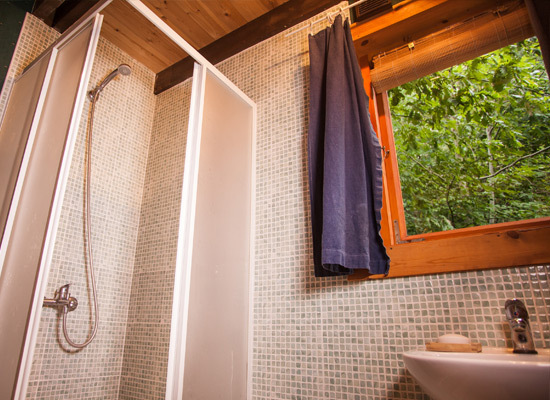 There is also a bathroom with a shower cabin. 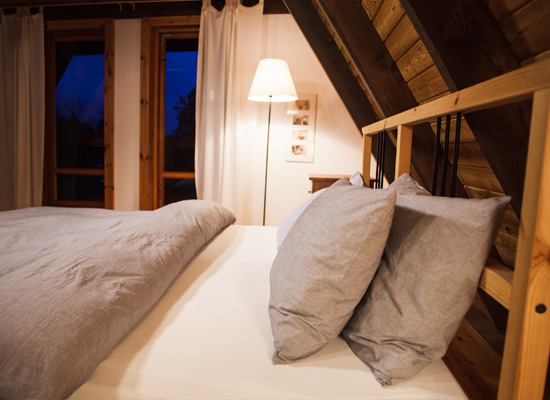 There are two bedrooms located on the first floor: a large one with a double bed and a balcony and a smaller one with two single beds, a wardrobe, chest of drawers. There is also a small closet where you can store your luggage or your clothes. In the large bedroom there is enough room to put in an extra bed for a child. 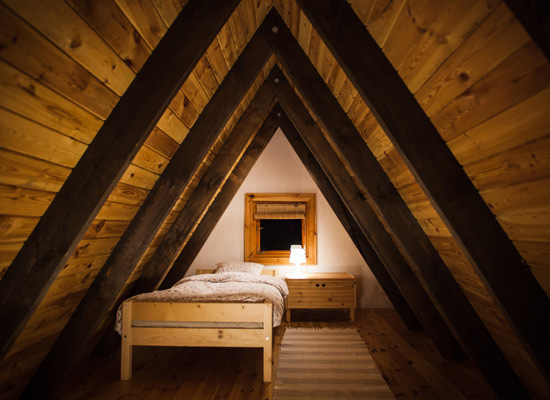 The last third bedroom is located in the attic. There are two single beds and a chest of drawers. If necessary an extra bed for a child can also be put in here. There are four deckchairs, a sun umbrella and garden chairs. 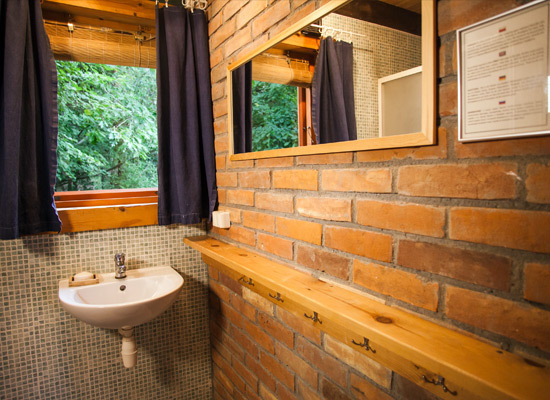 The cottages are located in a way to guarantee maximum privacy. If it is necessary, you can use a washing machine, iron or a charcoal barbecue free of charge. Free parking for two cars for each cottage. Traditionally the holiday season begins on May 1st and ends in October. 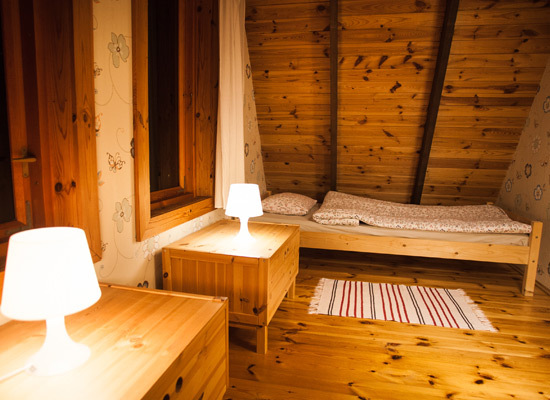 In high season (July - August) we rent the cottages for seven day periods (from Saturday to Saturday). 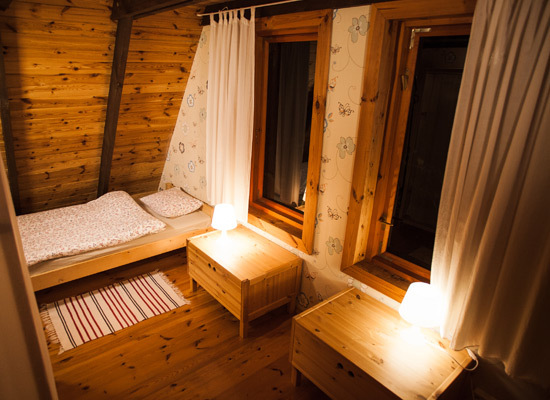 In other months the cottages can be rented for shorter periods (not shorter than two days). The price depends on the date of rental. Please contact us. We will be happy to answer all your inquiries. Check-in: 6 p.m. Check-out: 11:00 a.m.
Pets are allowed only after receiving our permission. Smoking is prohibited inside the cottages and on the lake deck. 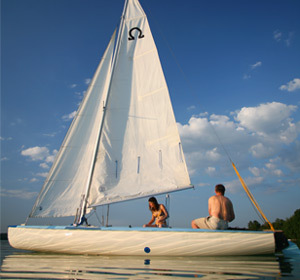 By boat, sailboat, kayak - explore the local area. You can visit Birds' Island or Moon Bay. You can also take part in organized kayaking trip: there are a few routes to choose from depending on difficulty - also suitable for children. 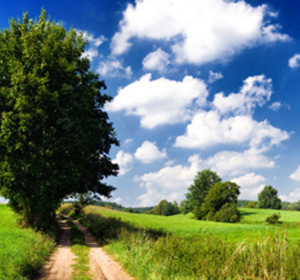 Whether you prefer hiking or biking, the local forests and meadows are perfect for a short excursion or a morning run. There are a lot of interesting bike routes nearby. The forests are full of mushrooms and blueberries. 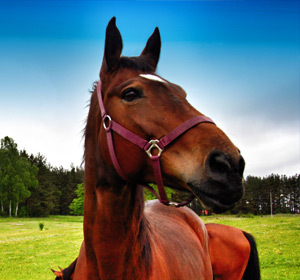 You can learn horse riding in the nearby stud farm in Kurki. For those of you who are keen horse riders, you can enjoy great rides through the most beautiful scenery. There are two convenience stores in the village. In high season they are open every day. All essential products can be purchased there. If you fancy larger shopping, you will need to travel to Stawiguda (8 km) or Olsztyn (25 km). You can try local food in 'Zloty Strug' restaurant in the village. It is open every day and serves breakfasts, lunches and dinners. On selected weeknights they organize concerts and dances. 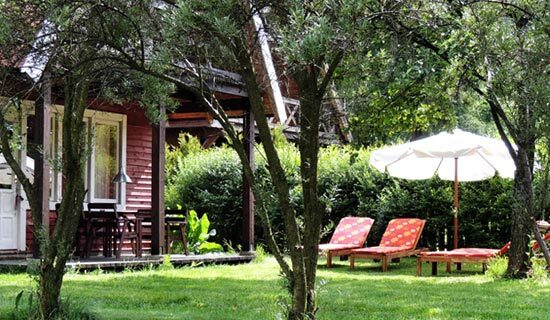 You can also visit a restaurant in 'Warmia Park' hotel which is located a 10 minute walk from the village. There is a newly build playground just next to the public beach in the village. It is located directly on the lake. The slides and swings will keep the kids busy all day. There is also Aquapark next to 'Warmia Park' hotel. It is hugely popular with both adults and kids. In the nearby area you can visit the ethnographic park in Olsztynek, battlegrounds in Grunwald, the town of Olsztynek and the nature reserve of river Łyna with its endangered swamp turtle. There are many events and festivals taking place in the region in summer. The re-enactment of the battle of Grunwald takes place each year in July on the anniversary of the battle. It attracts thousands of tourists form Poland and abroad. There are also a couple of summer festivals taking place in the capital of the region Olsztyn. There are no direct transport links to the village. The nearest train station is located in Stawiguda. We are happy to arrange your transfer from the train station in Stawiguda, Olsztyn or the airport Olsztyn - Mazury (SZY).